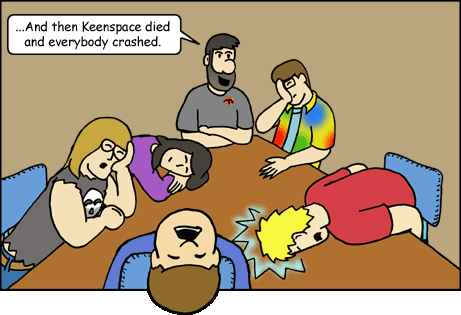 Welcome to another impromptu Week (Or Two) That Keenspace Died! This time the crash was severe enough that, though my site returned in a day or two (complete with corrupted and non-visible front-page comic) I was unable to access the site to make any updates. Thus was Once Upon A Table stranded in a lonely void of chaos and pain. When this sort of thing happens I like to delay the new comics until all has returned to normal, so as to not leave behind readers who might not find the new comics I may put of at one mirror site or another. However, I also dislike leaving empty spots in my archive calendars. Just like I did the last time, I was nice enough to provide some filler material at (roughly) normal update times… only this time I was forced to do so in the forums which, amazingly, survived the onslaught. And so I now provide those filler pieces in a vain attempt to plug the holes that would otherwise appear in my archive history.